This Nutella Chocolate Tart is rich and decadent – It is a super chocolatey and awesome Nutella Crostata with a gorgeous lattice topping! GREASE a 28cm round shallow baking tin with a little butter. MIX the soft butter and flour in a large bowl or free-standing electric mixer, until it resembles fine sand. ADD the egg yolks, sugar, cocoa powder, lemon zest, vanilla essence and baking powder and mix until well combined and forms a dough. COVER the dough with cling film and rest in the fridge for 30 minutes. TEAR off one quarter of the dough and set aside. ROLL out the remaining pastry until it’s 0.5cm thick and large enough to line the prepared tin. SPOON the Nutella into the pastry case and spread to form an even surface. FOLD over any excess pastry around the sides to create a 2cm-border. ROLL out the remaining quarter of the dough, on a floured surface, and cut into long strips, about 2.5cm wide. 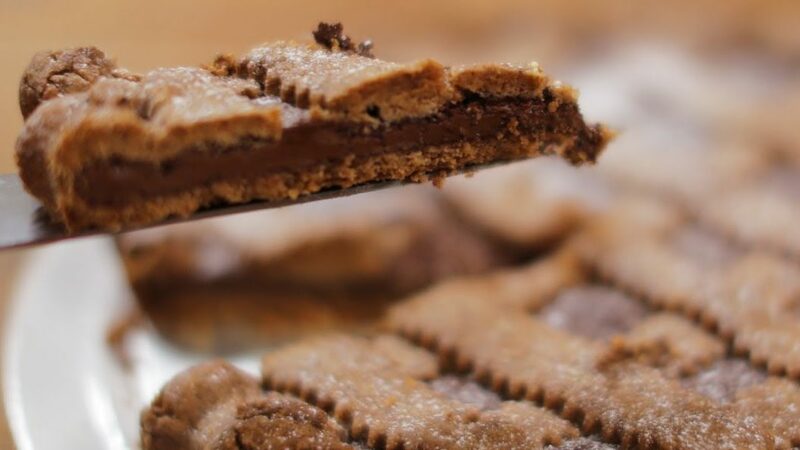 USE the strips to create a lattice effect over the top of the Nutella. BAKE in the oven for 30 to 45 minutes, until the pastry is golden brown and leave to cool in its tin before serving.